Football is officially starting up, and that means it’s time for all the game day snacks. Most dips are tough if you’re on a dairy free diet, because many contain cream cheese or cheese. 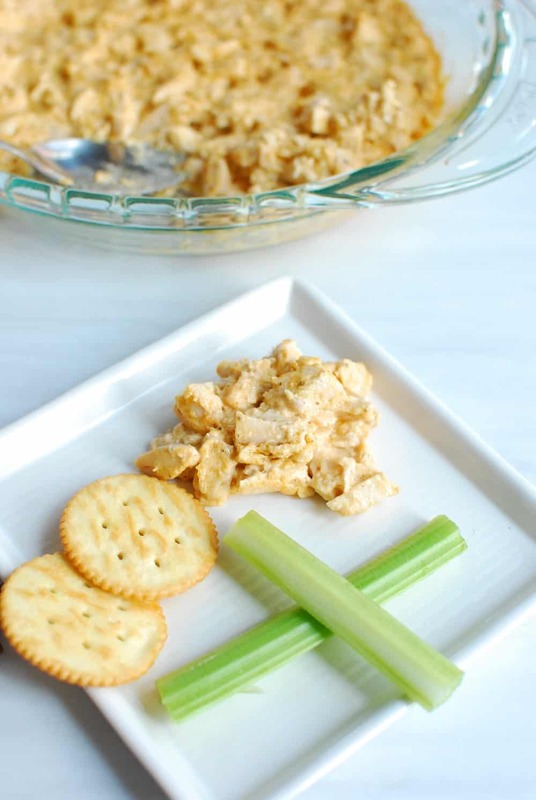 But with this dairy free buffalo chicken dip, you get all the rich indulgent flavor with none of the dairy! 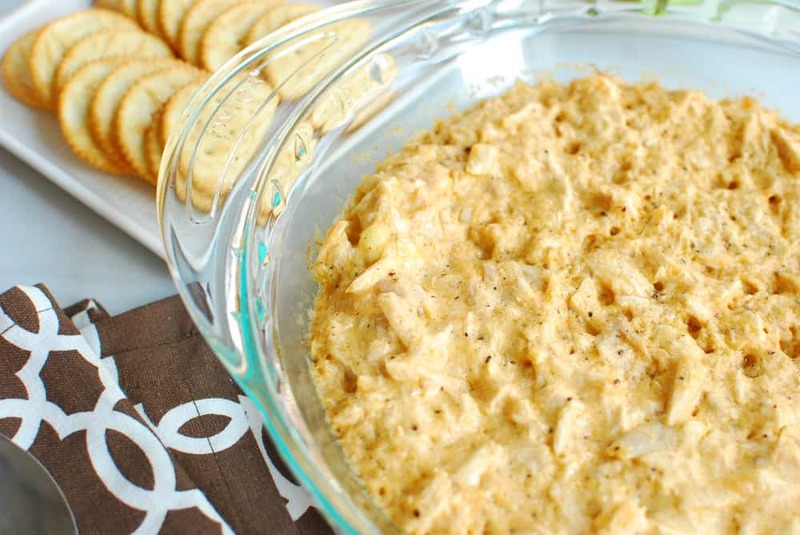 Buffalo chicken dip is probably one of my top 10 favorite foods. I mean, it’s spicy, it’s filling, it’s rich – it’s just so good. 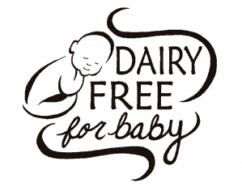 When I had to be dairy free for nursing my kiddo, I remember going to a Christmas gathering and being so sad that I couldn’t eat the dip. While it took me a while to find a way to recreate that same flavor without the dairy, I think I’ve finally gotten it down pat. Yes, I know it sounds kind of gross. 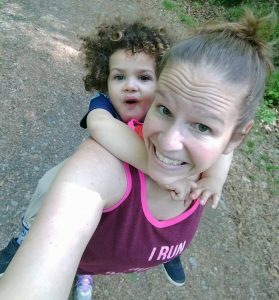 A dip with a bunch of mayo – for real? But I promise, it tastes amazing. The mayo mixes together with the buffalo sauce to create that indulgent flavor you’re craving. 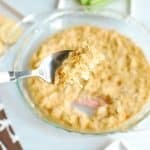 This buffalo chicken dip is dairy free, and can also be wheat/gluten free (as long as the mayo meets those requirements, which most do). Need a soy free option? 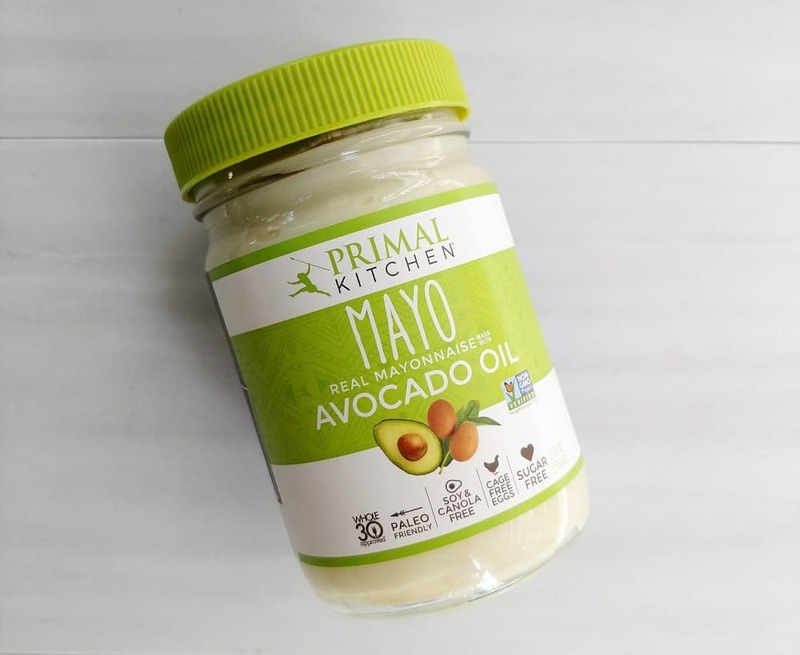 Try Primal Kitchen Mayo – This mayo is made from avocado oil and contains just a few simple ingredients. It does contain eggs. Need an egg free option? 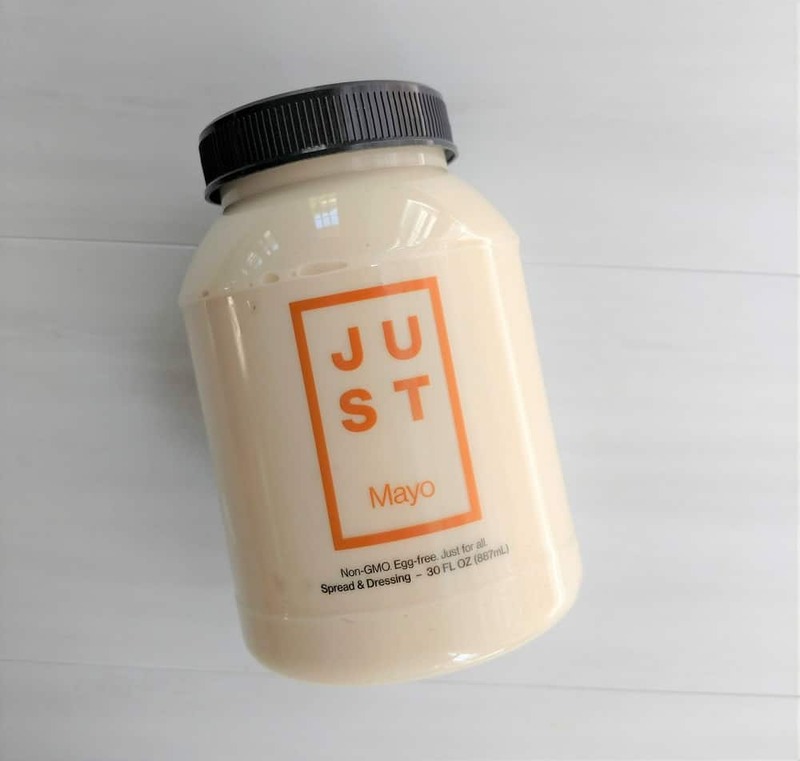 Try Just Mayo. It uses pea protein to help thicken it rather than eggs. Note that it may contain soy. Need an option that’s both soy free and egg free? 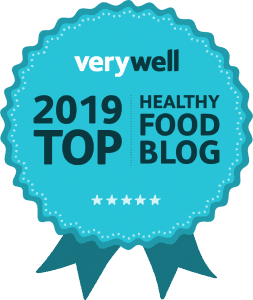 Try an aquafaba based mayo. These are thickened using the liquid that beans soak in. You can make it yourself if you’ve got some extra cans of beans lying around, or you can try a store bought option like Chosen Foods Vegan Mayo. My go-to is the standard pairing of crackers. Despite their buttery taste, most crackers on the market these days are surprisingly dairy free*. *Of course, product formulations can change so always double check the label prior to eating any of these. 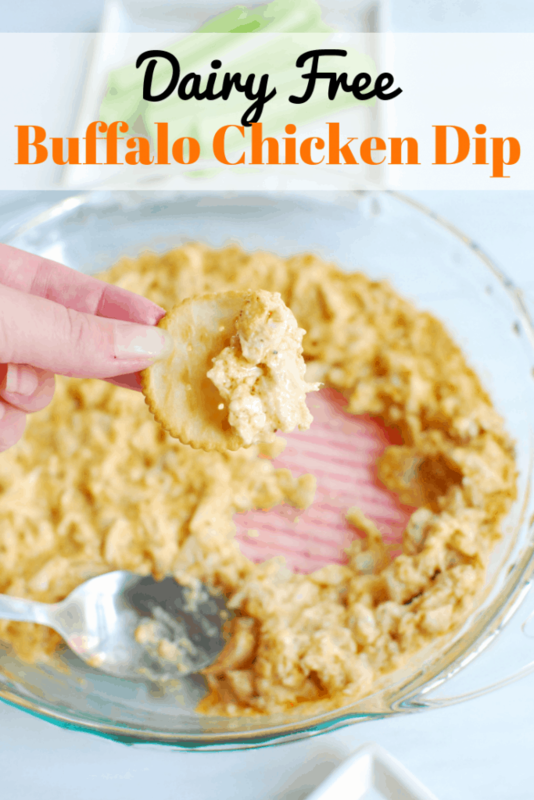 Whether you’re looking for a game day snack or a party appetizer, this dairy free buffalo chicken dip has all of the tasty flavor – with none of the dairy! Mix together all ingredients in a bowl. Pour into a casserole dish and bake at 350 degrees for 20 minutes, or until mixture is hot and bubbly. Let cool for a few minutes and then serve with crackers, celery, or other desired items! You can use any cooked chicken that meets your needs. I generally just take extra plain chicken that I made for another recipe, chop it up well, and use that. The mixture may look a little oily when you take it out of the oven; that's OK. It won't taste oily. Share with me: What’s your favorite game day snack or party appetizer? 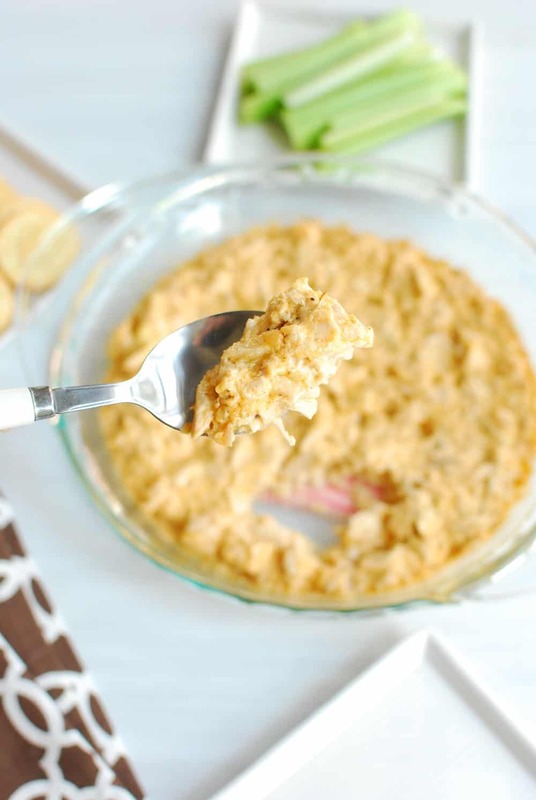 If you made this dairy free buffalo chicken dip – what did you think? This looks so good. I may try dairy free blue cheese dressing instead of mayo. I love, love, love blue cheese on chicken wings, so I think adding it to this dip would work for me. Maybe a combination of mayo and blue cheese dressing. I have tried Daiya blue cheese dressing on chicken wings and really like it. Thanks for the recipe.